Mauna Kea -- THE hardest bike climb in the world. Mauna Kea is the most difficult bike climb in the world. Adjectives do not describe this climb. Distinguished by the highest Fiets Index in the world, Mauna Kea is a monstrous, nearly impossible ascent. In addition to the daunting climb, cyclists must be mentally and physically prepared for changing weather conditions, altitude sickness and varying terrain on this extremely challenging 42 mile climb. Not much vegetation on a volcano. What Makes This the World’s Hardest Road Bike Climb: The sheer elevation ascended (13,000+ feet), the average grade (9.9% for the last half of the ride), dealing with the gravel for 4.7 miles, the altitude (be prepared for the possibility of altitude sickness, as it commonly occurs above 8,000 feet; Wikipedia), and dramatically ​changing weather (for example, rain and 80 degree weather in Hilo, followed by wind, snow, and sub 40 degrees at the top, depending on the season). We climbed the volcano December 20; it was 73 degrees in Hilo when we started, and we endured as low as 34 degrees and blustery snow towards the summit. When to Climb Mauna Kea: We have taken on Mauna Kea once in May, twice in June, and once (foolishly) in December. We recommend going in May or June, as these are the lowest rainfall months for the start of the climb in Hilo. The highest rainfall months there are March, April and November. The temperature throughout the year always averages in the 70s so it will always be warm in Hilo when you start but often extremely cold (in the 30’s and snowing in December, 2013 when we rode to the top). Mauna Kea summit, December 20, 2013. End of the gravel. May 2018. 40mm gravel tires on a Specialized Crux cross bike. Make absolutely certain you have warm clothes for the trip above the visitor center. The temperature will be between 25-40 degrees lower at the top than in Hilo at the start. What Gear to Bring to Climb Mauna Kea by Bike: We have always done the paved portion of the climb with a compact disk and in 2011 (28t cassette at age 55), 2013 (30t age 57), 2014 (32t age 58), 2018 (28t chainring and 42t cassette - age 61 - see a trend here . . ) In 2018 i used a specially fitted Roubaix Crux cross bike that I used 30mm tires for pavement and 40mm knobby tires for the gravel. As noted above, bring very warm clothes for the top. You may also wish to bring breathable rain gear because there is a good chance of rain in Hilo, regardless of the month you pick to tackle the climb. Mauna Kea as seen from across the saddle (and through JJ) from Mauna Loa. December 2014 Start - 79 degrees (35 at the top when we finished). May 2018 start. Lucky again, a rare dry morning in Hilo. Where to Start: The traditional start for Mauna Kea, and the location that ranks Mauna Kea as the highest rated bike climb in the world, is Hilo, Hawaii. We have always used Airbnb or VRBO for our rental accomodations. In 2018 we stayed in Hilo within one mile of the start which was perfect for the Mauna Kea climb. The alternate route from the west side of the Island (Waikoloa; commonly known as the “Kona side”) is 59 miles (15 miles longer than from Hilo) and thus necessarily ranks lower on the Fiets scale (21.82 v. 28.9 from Hilo). The comparative statistics for the western approach are: Miles: 59 v. 42.6, average grade 4.6% v. 6.1%. The first 44 miles from the west are at 3.3%. The final 14.8 miles from the start of Mauna Kea Access Road to Summit are at 9.2% and go from 6,579’ to 13,771’; that stretch alone is a 23.4 Fiets which would rank the final leg of Mauna Kea at #4 in the world if we only rated that fraction of the entire climb. What does that tell us? Save your energy for the last 14 miles of the climb. First Leg, Hilo to Mauna Kea Access Road: The first leg of this journey is the "easiest" part of the ascent. With a Fiets score of 10 for this segment alone, it would rank #29 in the U.S. Top 100. Amazing banyan tree on Waianuenue Ave ½ mile up from the start. Just turning onto Saddle Road from Kaumana Dr.
Mauna Kea in the distance. Aerial photo looking back east along Saddle Road towards Hilo. Traffic flies by, but there is a very wide shoulder. Mauna Kea from . . . you guessed it . . . mile 16. 26.7 miles, 9,730’ at 6.9% to go. 30 mile mark - 6,950’ - Mauna Loa is in the background. 12.6 miles, 6,765’ at 10.1% average grade to go. Just about to rise above the clouds -- 8,000’. Visitor Center - Swap out to a mountain bike here (these can be rented in Kailua at the Bike Works), or swap from road to cross bike tires. Visitor Center at 9,200’ and 34 miles into the climb. Some decent provisions at the Visitor Center: pre-made sandwiches, drinks, etc. Warning Signs, they don’t give you much incentive to continue past the Visitor Center. Third Leg, Gravel Section: 2/10th mile after Visitor Center - you must have 4 wheel drive (Harpers Rentals in Kona and Hilo are great!). If the first set of warnings weren’t enough . . .
. . . here are a few more to chew on! Five switchbacks that are murderous -- they are generally steeper than the straight road and at the steepest sections cause your rear wheel to slide towards the inside of the turn. View of the Visitor Center from the gravel road about a mile up. It’s a long, lonely grind up this segment. End of gravel just over the rise. Many “cinder cones” along the climb. Sorry for the shaky video, but . . . well . . . I was a bit shaky at the time . . .
Stacy Topping flying off the gravel and back onto the pavement. Summit of Mauna Loa barely visible above the clouds. At the end of the gravel, you may wish to swap back to the road bike, or continue on the mountain bike with its lower gears as the final stretch presents a serious challenge to the climber with its altitude and extreme pitch in places. are the only paved roads topping 13,000’ in the U.S.
It’s still no picnic after you return to the pavement! ½ mile 15.9%, 1 mi 13.9%, 2.5 mi 12.6%. About a mile from the summit, riding above the clouds. Nearing the top and the Gemini Telescope. Mauna Loa barely peeking above the clouds in the background. Roadway and Traffic: The roadway surface is always from very good to excellent (except for the 4.7 mile gravel section from miles 34-39). Traffic is another matter. The first six miles and last fourteen are fine. The 22 miles on Saddle Road (Highway 200) are a bit more daunting as you are on a major highway which connects the east and west sides of the Island of Hawaii (the Big Island). There is almost always a wide shoulder, but there are plenty of vehicles that whiz by at highway speed, so beware of that (bring flashing red taillights with backups and extra batteries in case your first set run out of power). Supplies and Provisions: After the convenience store on the south side of Waianuenue Avenue one mile from the start, there are no supply stops until 34 miles later at the Mauna Kea Visitor Center. The four times we have climbed Mauna Kea we have gone unsupported to the Mauna Kea Access Road (mile 27.5), then unsupported again to the Visitor Center (6.3 miles) and then had SAG support intermittently from the Visitor Center to Summit. ​This climb has the highest Fiets Index Score (by far) of any U.S. climb. It also ranks as the most difficult climb by bike in the world by the climbing site ClimbByBike. Yes, that is Snow in the background . . . in June . . . in Hawaii!!!! December, 2013 -- encountered snow. June, 2014. A perfect day, but still very windy and chilly -- high 40’s at top. Ron at the top, Gemini telescope in background. When cyclists talk about the greatest climbs in the world, most can agree that Alpe d'Huez is the most famous, Passo de Stelvio is the most spectacular and Mt. Ventoux is the most iconic. But when the discussion turns to the most difficult, this climb leaves no doubt to which climb is number one. The undisputed heavyweight champion that wears the crown as the world's most difficult climb is Mauna Kea. Located on the Big Island of Hawaii, this climbs rises from sea level to 13,800 feet in 42 miles. Although the average grade of just over 6% doesn't sound like much, how you achieve this grade is anything but easy. The first 27.5 miles of this climb, which has an elevation gain of 6,500 feet, is a steady climb with a few variable sections of flat to steep rolling grades. This section is consistent and challenging but never overly difficult. It's not until you get to the turn-off to the Mauna Kea access road that this climb shows its teeth. The next 14.5 miles is the business end of the climb with grades that will make you wish you never heard of cycling up mountains. In a word, the statistics for the last 14.5 miles are unbelievable. To better describe the final 14.5 miles, it's best to break it up in 3 sections as each one is very unique. The first 6 miles which ascends to a visitor center ascends 2,600 feet with an average grade of 9%. This may not sound like much but there are two 1 mile sections in this climb that have average grades around 14% to 17% with a maximum of 20%. Once you get to the visitor center, which sits at an elevation of 9,200 feet, you may feel like you've been put through the ringer, but unfortunately all you've experienced is an appetizer. The next 8.5 miles are the closest thing to hell that you will ever experience. I've personally done every major HC/beyond classification climb in the United States and several in Europe, but nothing has ever prepared me for what I was about to do. As you leave the visitor center, the paved road ends and you are greeted by a soft gravel road comprised of dirt, rocks and volcanic sand that can barely be traversed with a mountain bike let alone a road bike. This section is just under 5 miles long with an average grade over 11% and a maximum grade of 25%. There were times that when I looked up the road, I thought the incline I was seeing was an optical illusion as the steepness of the road didn't look real. When riding this section of the climb, the challenge is trying to keep your bike upright as you're constantly trying to find a section of road where your bike doesn't sink causing you to spin out and ultimately fall down. Of course your speed is probably around 3 to 4 mph so if you fall, your problem wouldn't be hurting yourself but rather trying to get back on your bike and start pedaling again up a steep grade in loose sand and gravel. Once you mercifully make it through the gravel section, you may feel a sense of euphoria as you now have a paved road all the way to the summit. Of course that euphoria, which is probably due to the high elevation, is quickly dashed as you realize that the next 3.8 miles will require you to climb another 2,100 feet with an average grade of almost 10%. If the mere thought of these statistics weren’t enough to scare the bejesus out of you, the giant switchback that's in front of you as you approach the summit will make you cry uncle. To be honest, I've seen a lot of switchbacks in my time of tackling beyond classification climbs, but this one looked like as escalator in terms of steepness. After getting to the base of the switchback, just past the 13,000 foot elevation marker, I came as close as I’ve ever come to quitting a climb! The only thing that kept me going was the old saying "pain is temporary, but glory lasts forever." With those words echoing in my head, I did the final death march to the top. Once I made it through the switchback, I made visual contact with the observatory as this massive landmark that I could barely see as I started my ascent from the ocean in Hilo was now right in front of me. As I took my final pedal strokes to the summit, I looked to the heavens and gave my Dad a salute as this was a climb worthy of a great man who watched his son ascend this monster climb. Although I didn't hit my goal of a ride under 6 hours, I was pleased with my time of 6 hours and 28 minutes. Without a doubt, Mauna Kea is a very special climb. The memory of this ascent is something that that I'll remember for the rest of my life as I can now finally add the world's most difficult climb to my resume. 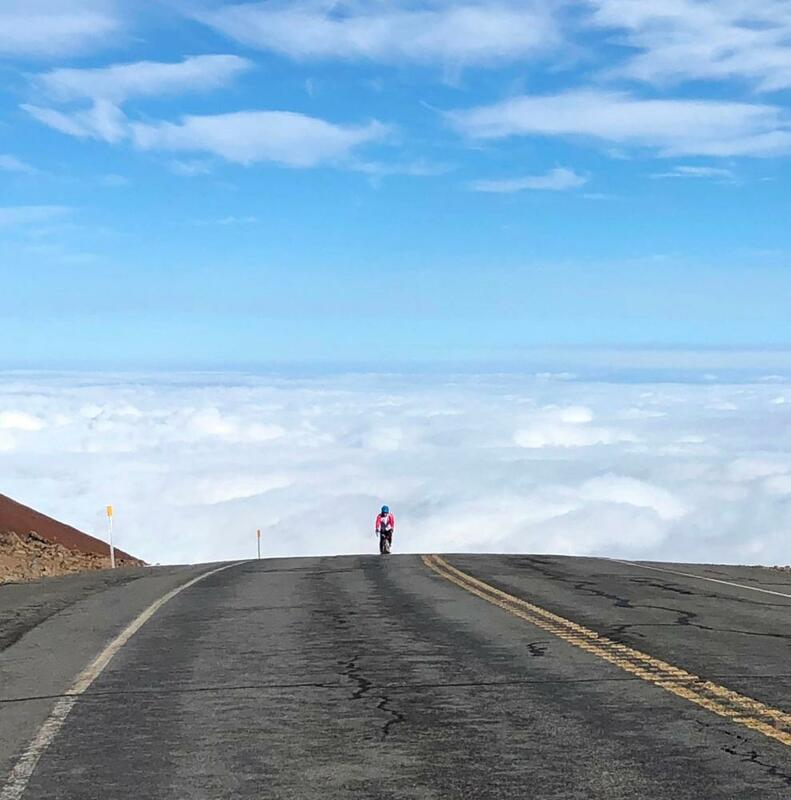 It doesn’t matter which difficulty index for climbs you use, the Mauna Kea climb from Hilo always appears #1 and so is the world’s toughest climb by bike. Therefore it is literally “the mother of all monster climbs.” We did the climb with a group of 6 riders guided by someone in a van (which was great in terms of water/food/MTB supplies). When you go for this climb you know it is just a matter of getting there instead of going for a top-notch time. As a group we decided to stay together until the visitors center. After that it was everybody on their own, survival time. The entire ride until Mauna Kea access Road we saw the Mauna Kea (no clouds that day) challenging us...it made the experience even more exciting ☺. You could feel the excited and fear from all the riders. The Mauna Kea access road to the visitors center was the real first challenge, with one km of 14% average. But this was ok, no real pain yet. We switched to mountain bikes at the visitor’s center and knew the real challenge would come in now. U.S. second 10km steepest average gradient section is in the final 14 km to the top, hell starts now! What a section the dirt 7.7kms were. A few times I had to accept a “Johnny Walker.” Sections of 20%+ when my back wheel slipped away, no other choice but walking (since getting on the bike was impossible). The two experienced Mountain Bikers in the group did extremely well though. In the final section to the top we used our mountain bikes as well (this was a logistical challenge with 6 bikes) All of us were using our deepest reserves to get up. Seldom I have experienced such a strong desire to “get there,” still enjoying the beauty of the landscape while suffering big time. The section of the road was filled with orange shirts all riding “the postman technique.” It was just impossible to follow the road in a straight line. To steep and to less oxygen. The last 2km were not the toughest, because the gradient is not that extreme anymore (just 10% average) and you feel the victory. As a passionate cyclist, the is the must climb mountain in the world. Seldom I have felt so proud on the top of a climb. My primary comment relates to the gravel portion. I think that when I go back next year, I am going to ditch the mountain bike, and ride instead a gravel bike setup, with tires in the 40-42mm size range (there are several good cyclocross tires that would work for this). The mountain bikes are heavy, and the 29er I had I didn't think was ideal for that surface. 29ers roll well over rough trails and such, but on gravel like on Mauna Kea, I think they are a bit unwieldy, and even a 26.5" standard mountain bike would be better steering-wise. Ideally I will take just one bike, with two sets of wheels, and with a mountain bike gearing range (what I have on my travel road bike now). There are a lot of good gravel capable road bikes out there (like a Moots Routt 45 or cheaper similar) that ride ok with regular road tires but can accept wheels with tires up to 45mm. One thing I will do for sure is check to see if the Saddle Road is under construction, and what type of construction. The road was more or less destroyed during that section this time. For this past trip I checked the access road condition frequently, but didn't think to check the Saddle Road. In my defense, usually construction on a regular road doesn't involve tearing it up completely as they did here. Climbing the Mauna Kea volcano is the most difficult road bike climb in the world. We have cycled to the top of this monster 4 times and can fully attest to its status as World Bike Climb #1.